The largest fundraiser of the year for the Make-A-Wish Iowa organization has been shutdown nearly three weeks ahead of schedule. Jolly Holiday Lights in Des Moines Water Works Park typically runs from just before Thanksgiving through New Year’s Day. 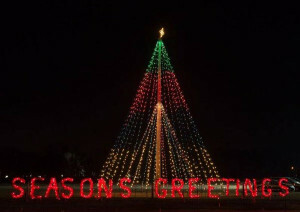 Record-setting rainfall over the weekend flooded the park and damaged many of the nearly 100 lighted displays. Jamie Rasko, spokesperson for Make-A-Wish Iowa, says the tough decision was made Sunday to close it down. “We’re really disappointed to have close 18 or 19 days early,” Rasko said. This marked the 20th anniversary for the event and it had never before been closed by extreme weather for such an extended period. The impact on Make-A-Wish Iowa’s annual budget will be “significant,” according to Rasko. People pay to drive through the display and the money raised helps grant the wishes of children living with life-threatening medical conditions. “Last year, we raised enough money at Jolly Holiday Lights to grant 40 of our wishes. We granted 189 over the year, so it was a significant impact on our wish numbers,” Rasko said. Many people who prepurchased tickets to Jolly Holiday Lights are telling Make-A-Wish Iowa to keep their money. Rasko says that’s greatly appreciated, but the organization will still miss out on a lot of cash by shutting down so early. “We’re hoping to have the public help us out to make up for that lost revenue by either donating what they would have paid to get into the event itself or just making a contribution for their end of year giving to Make-A-Wish…so we can continue to grant the wishes we’re granting,” Rasko said. Volunteers spent much of the day Sunday, in the rain, trying to salvage the lighted displays, banners, and other materials.